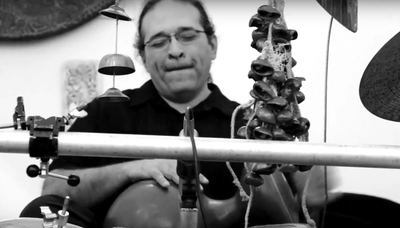 "I play the silence a lot..."
EL MONSTRO is a hybrid kit using hand, finger and stick percussion and sometimes electronics. HOW DID THIS PARTICULAR CONFIGURATION OF INSTRUMENTS COME ABOUT? 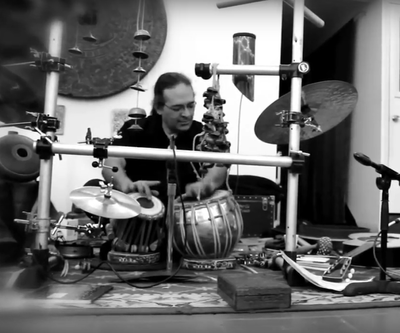 there are no acoustic instruments other than PAISTE cymbals and a snare drum. WHAT ABOUT THE HIGH HAT? They are PAISTE 10" highhats that I either play with my fingers, sticks or mallets. with a 14" Crash above that are on my right hand side. On my left side there is an 18"
and some splash cymbals, all are PAISTE. ARE THEY DESIGNED TO BE PLAYED BY THE HANDS ALONE? No, but they are very responsive to fingers, sticks or mallets. IS THE HIGH HAT FOOT OPERATED? drum to be what I needed in regards to pitch and timbre. HOW DO YOU GET THAT SHAKER AND/OR TAMBOURINE SOUND? ​or dotted eighths, i.e., it depends on what is happening at the time. HOW DO YOU HOLD A SHAKER BETWEEN YOUR TOES? I use either a miniature shaker or a tambourine. WHY DON'T YOU USE A BASS DRUM PEDAL? AND YOU WOULD ALSO HAVE TO PLAY SITTING ON A CHAIR? With a double bass drum pedal you can still play a bass drum over to your right while still sitting on the floor and playing hand drums. Highhat would be a little more difficult since I am down to 3 limbs and usually play the MIDI pedal with my right foot. WHY A MIDI TRIGGER IF YOU ARE PLAYING ACOUSTIC MUSIC? instruments, hopefully where you cannot tell where one ends and the other begins. WHAT SOUNDS ARE YOU TRIGGERING? 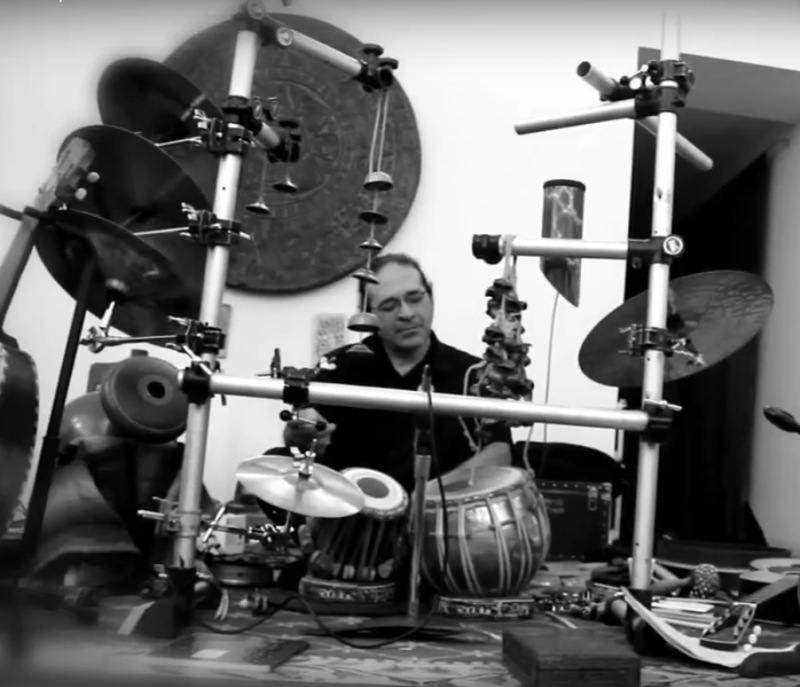 WHY SO MANY DIFFERENT INSTRUMENTS? Actually I love the colour of sound and changing it according to what is happening musically at the moment. I now have wood, gourd, skin, clay and metal(s) and voice and access to MIDI instruments and samples. Actually they are not drumsticks, they are Wok cooking sticks. you might as well plug in an electric guitar, which is something we don't do in that ensemble (DEMANIA*). and further away from being an acoustic ensemble. DOESN'T MICHAEL MANRING PLAY ELECTRIC BASS? Yes, very much so, but he is an anomaly, isn't he? Michael should be called 'EL MONSTRO" . guitar the dynamic level goes from - 3 to + 6 since there is no snare drum and/or bass drum being played louder than that. 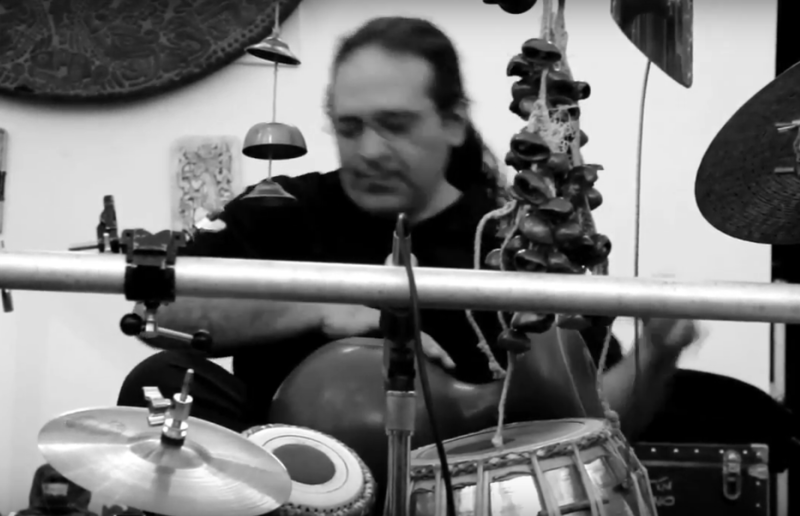 WHY DO YOU PLAY CYMBAL AND TABLA AT THE SAME TIME? It just makes sense as sometimes the music we are playing is more harmonic than melodic. the bongo cajon. But every drum whether it is tuned to a specific pitch or not has a relative pitch. DOES THE PITCH OF THE LOW DRUM INTERFERE WITH WHAT THE BASS IS DOING? It can. With North Indian tabla you are either playing resonant or non - resonant strokes/tones. 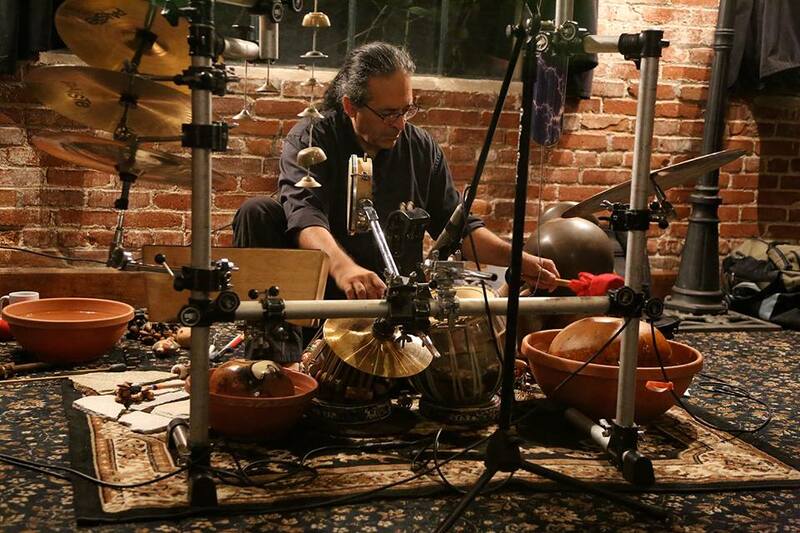 ​but I can also play "one" with a closed non-resonant stroke for additional percussive effect. 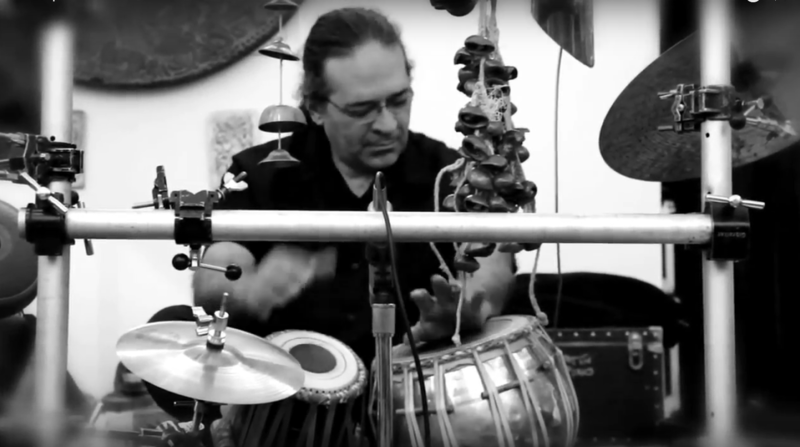 WHY DO YOU DIFFERENTIATE TABLA FROM NORTH INDIAN TABLA? I played my darbuka and put my tabla away. NO, WHAT I MEAN IS HOW ARE YOU ABLE TO DO THAT? or why you do it. Absolutely! Anyone at all, understanding that the work is its own reward. Not only when you have a paid gig. MUSIC is a sacred thing, an amazing gift …. and playing in time and in tune, and getting paid to do that or to teach. or I should stress, for me anyway. a very specific thing, but I don’t have student’s who come to me every week or every month. Amazing teachers are like amazing human beings. ​about making and keeping that BALANCE……. in order to transcend the page. to do with being in the moment at the moment every moment. 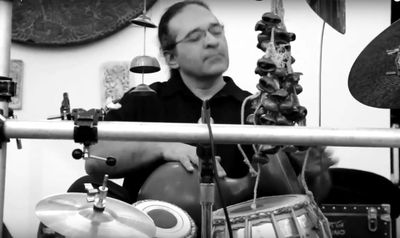 Each type of music has its own demands physically, technically AND spiritually. to different people in different situations. SOMETIMES THEY SEEM "NORMAL" AND OTHER TIMES? an ongoing rhythm with accents with and against it. i.e., you usually do not have 1 hand playing a straight repetitive figure, e.g., straight 8th's, and the other playing against it though it might appear that way when playing certain types of cycles. WHY DO YOU SIT ON THE FLOOR INSTEAD OF ON A CHAIR? I alleviate that problem, and I usually, never run out of floor. I also bring a small rug to put my instruments on. to do so without any additional noise and try not to miss a beat. HOW LONG HAVE YOU BEEN PLAYING THIS SET UP? Since 1988 but it is always changing - contracting and expanding. HOW DID YOU COME UP WITH THIS SET UP? The first person that I saw with a set up that incorporated hand and stick percussion while sitting on the floor was Collin Walcott, the percussionist from the group OREGON. 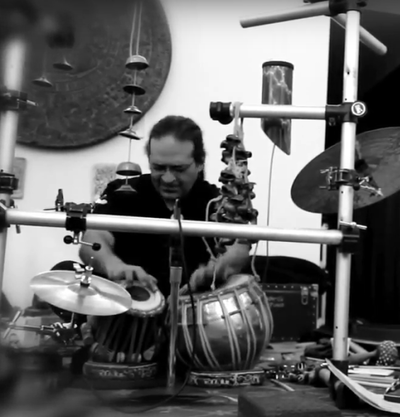 He had North Indian tabla and cymbals but usually did not play them at the same time, it was usually one or the other. He also played sawed off congas and sitar. Latin percussionists have been doing this for years, bongo players, conga players etc., but they usually use 2 limbs, sometimes 3, some of them now utilize a bass drum pedal to play clave and /or a cowbell. But the biggest difference is that they are usually not the prime time keeper, but an auxiliary percussionist working as part of a rhythm section. Collin was the first musician that I experienced being the only percussionist to supply rhythm and color without the use of a drummer and being BEYOND musical with it. BUT YOU MOUNT YOURS STRAIGHT UP INSTEAD OF GOING OUT ON EITHER SIDE. WHY? That is because of MAESTRO John Bergamo. One time we were in a music store looking at a cymbal tree, and he said, "Wouldn't it be great to have access to different cymbals that you could just take off or put on depending on the music. You could pull the cymbals forward or push them back without having to have a bunch of extra stands, just a cymbal bag." Much like an electric guitarist has access to different pedals to colour his or her sound. So the idea comes from Guru John Bergamo and it makes sense. WHAT KIND OF RACK DO YOU USE? Actually it is an old ultimate support keyboard stand that I bought for $20 and cut up. It is aluminum and is 1/3 the weight of stainless steel and very light. I can actually pick up El Monstro with everything on it and move it. WHERE DID YOU SEE OREGON? In Los Angeles at Hop Singhs, and at the Beverly Theatre, now both defunct venues. I actually got a chance to meet Collin backstage, the band had been touring without him because he had some rare form of pneumonia, I think, that was not responding to antibiotics and he was not up for touring but he finally got his health back and was able to tour.(1980?) They even made some jokes about him not being on the first part of the tour and worrying about performing as a trio. 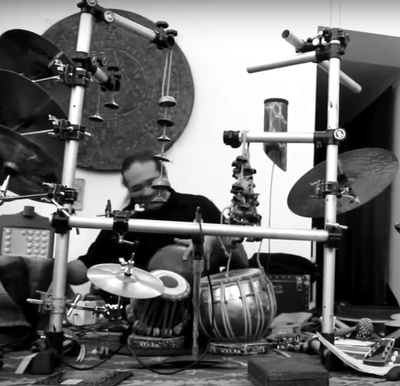 DID YOU EVER SEE OREGON WITH TRILOK GURTU? I saw them at the PALACE upstairs with Trilok Gurtu the first time they played in Los Angeles with him and I have also seen them with drummer Mark Walker when they played at the Jazz Bakery in Culver City, and of course I have seen Trilok when he was in the McLaughlin Trio. HOW WOULD YOU COMPARE THE DIFFERENCES? Each musician is very unique and brought themselves and their musicality to the table. 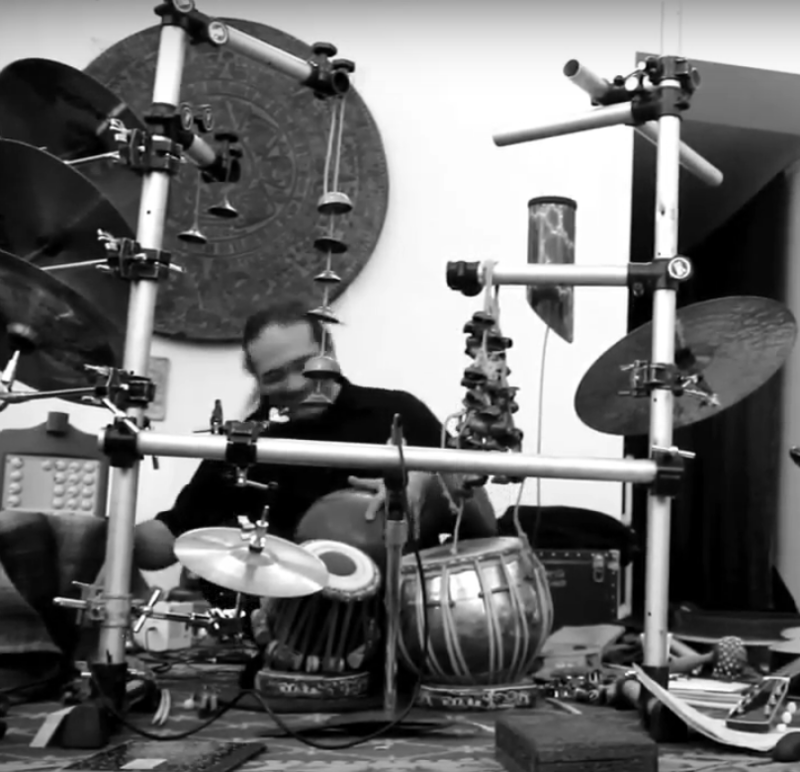 But Trilok is amazing in a whole different sense, his set up is basically a smaller version of the drumset, with a low drum below and to his left and another low drum up and to the right. It makes for some very interesting sound and groove combinations that are not readily apparent to a traditional drumset set up. Obviously no other person sounds like him when they play on a "regular" drumset sonically or rhythmically. DID YOU EVER SEE OREGON WITH JAMEY HADDAD? No, I never caught them with Jimmy Haddad. One thing I would like to mention is that I spoke to Collin and told him that I had just started taking tabla lessons with Pandit Tarnath Rao, in 1979, and he pointed to his bayan and told me that Tarnath had given it to him and that he had met him previously, I don't remember how exactly, but he made a point of telling me about it. 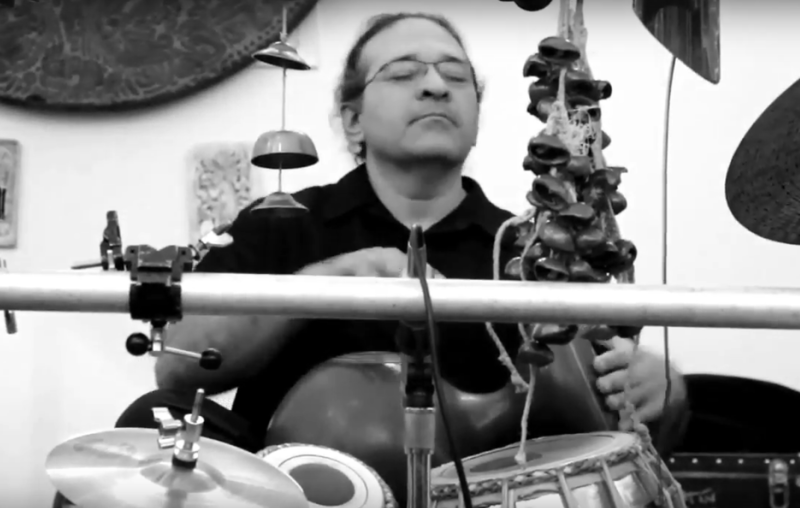 WHEN DID YOU FIRST HEAR TABLA? I was 14 or so in East Los Angeles (same planet, different world) playing garage band rock e.g.,Black Sabbath, Led Zeppelin, Edgar Winter, Cream, Beatles, Yes, Gentle Giant, Flash, etc., and it was 1973 and my bass players mom played a record for me (Black petroleum based circle with a hole in the middle) called, I think, Ravi Shankar's Festival from India which featured Alla Rakha who performed a tabla solo on the record where he recited and played. His son is of course, the other great MAESTRO Zakir Hussain who I would eventually hear and see with John McLaughlin's SHAKTI whenever they played Los Angeles a few years later. 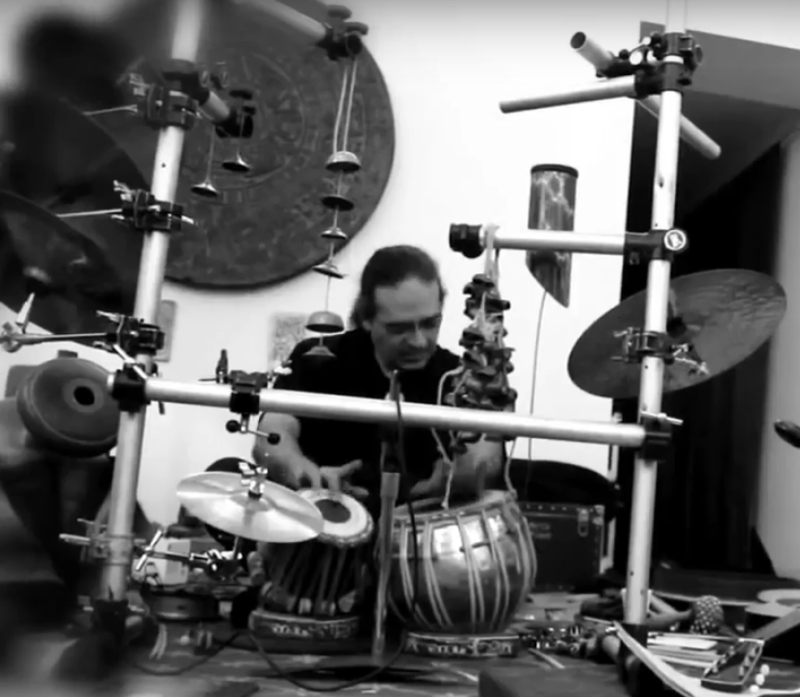 DID YOU WANT TO PLAY NORTH INDIAN CLASSICAL MUSIC? No, I just wanted to learn how to play the instrument and learn the rhythmic concepts. I knew of no musicians who played the music and/or owned the instruments in East Los Angeles, let alone Los Angeles that I could play with and learn from at that time - 1978. You have to understand that it is 1977 when I realized that I could actually study the instrument. ​The concept of "world music" and "new Age" music did not exist at that time. Record stores had the "international" section which usually consisted of 8 records, music from Africa, China, India and that's about it, usually "traditional and/or folkloric" music. Telling my parents that I wanted to study the drumming traditions of North India was not considered the wisest career move for a Mexican American kid growing up in East Los Angeles. There was no genre blending on the scale that it is now, there were no DVDs, videos, internet, or YOUTUBE.You had to look for stuff, go to concerts, and go to the library, find other kindred spirits that were not only into the music but actually attempting to perform it or maybe owned the records or instruments. Oregon and Shakti were my main inspirations in regards to acoustic music and blending different forms of improvisation with world instruments. Of course there are now many others who do that but they are the pioneers and definitely still doing it. DID YOU STUDY ANY OTHER HAND DRUM TRADITIONS? and of course we are specifically speaking of drummer percussionists, not all of the musicians I continually learn from. 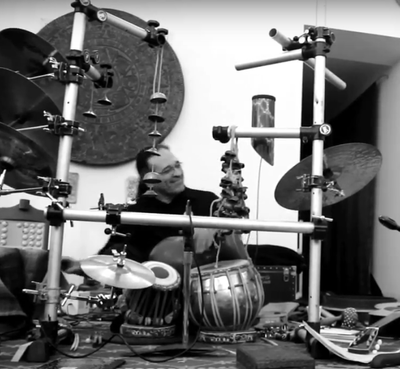 I have enough problems with drumset, marimba, tabla, percussion of indigenous Mexico and Mesoamerica, and composition to keep me busy and yet I have been very fortunate to have opportunity after opportunity to be sitting next to these gentlemen and make music with them at rehearsals and on stage, which is priceless. There is no better experience than the actual experience of doing it. I should stress, for me anyway. Once you learn the basics of those instruments the different techniques may apply to other drums, but the bottom line for me though has always been music, making music with the people I am with on stage, it has never been about chops to me, but the music, the rhythms and the colors. YET YOU DO HAVE SOME INCREDIBLE CHOPS. Not really, or I should say I don't think so. Music is communal and to me it is about the group effort and not how many notes I can play. There are many other percussionists who can run circles around me technically speaking, but that is not how or why I do what I do. 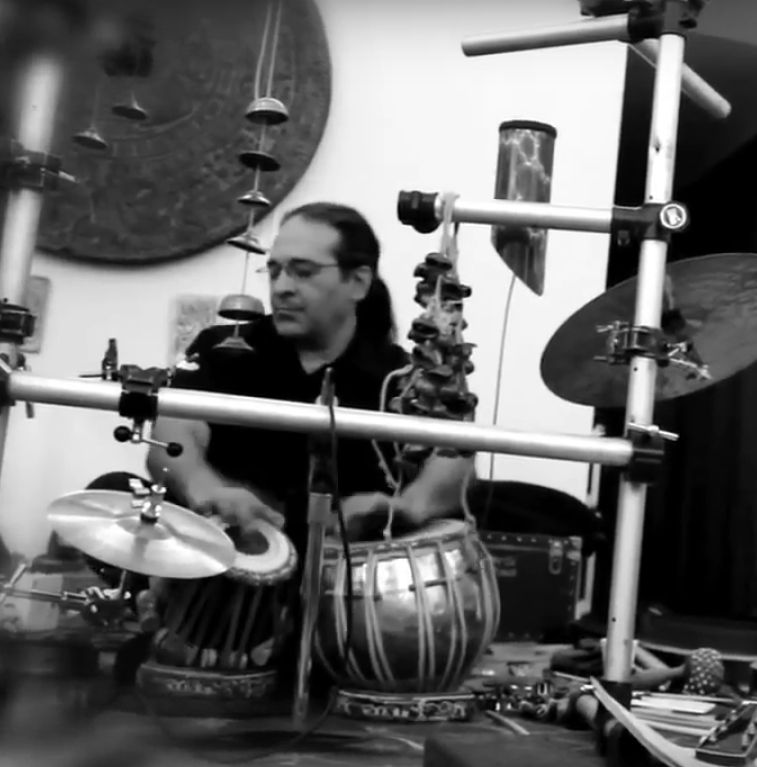 DO YOU EVER PLAY RHYTHMS FROM ONE HAND DRUM AND PUT THEM ON THE OTHER? 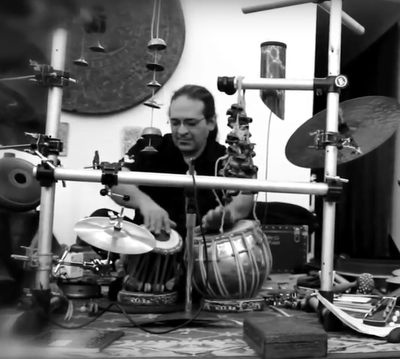 Each hand drum has very specific things that are idiomatic to each instrument, I don't learn stuff on one instrument and then apply it to another drum, unless I hear it that way. That is a little too academic for me. I tend to hear the instrument when I pick it up. The way your hand works playing South Indian kanjira is very different from your hands playing a dabruka or North Indian tabla, let alone going from hands, to fingers to sticks. A musician playing a banjo wouldn't hear it like a guitar when he goes from banjo to guitar, even though they both have necks and strings and are plucked instruments. They are tuned differently and resonate differently and I am sure when they pick it up they hear it. Same thing for horn players who go from soprano saxophone to tenor saxophone, or a piano player who also plays synthesizers, you can play the same notes but in different octaves and with different colors, each instrument has its own resonance and creates its own space and mood. BUT YOU CAN APPLY CERTAIN TECHNIQUES FROM ONE DRUM TO ANOTHER? else I could possibly play and I play the silence a lot. YOU STILL PLAY DRUMSET CORRECT? Yes, that is my first instrument. I play as much music on drumset as I do playing EL MONSTRO. WOULD YOU EVER CONSIDER PLAYING EL MONSTRO IN AN ELECTRIC ENSEMBLE? There are a lot of factors that have to be addressed in order for that to work efficiently. I would either have to play with headphones to hear myself over an electric guitar or the guitarist would have to be physically far away for us to work musically. When you have to amplify a hand drum to the point where it is no longer in an acoustic environment, i.e,. where I can't hear myself without monitors or headphones I would rather play samples. it is obviously not the limitation of the instruments. ​and so many to learn from and so little time.